Alyce from Blossom Heart Quilts sells a monthly bundle of Japanese fabrics that she selects (because she's awesome and lives in Japan). She sells them here in her Etsy store. August's theme was cool colors and boy was I happy to see what Alyce picked! I am still tempted to buy September's bundle which is Fall. They go fast so don't hesitate (like I am doing)! 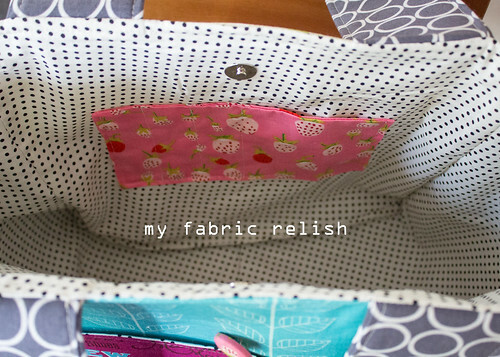 ...because I needed the scraps from this bag so I can make all the other matching goodies from Patchwork, Please. I need everything to coordinate and decided to make the largest item then all that was left was fair game. I know y'all know what I'm preaching! Left in the book is a travel sewing kit, ipad pouch, and a couple of zipper pouches. I thought about just holding onto this bag and then share it the week it was due, but what's the fun in that?! 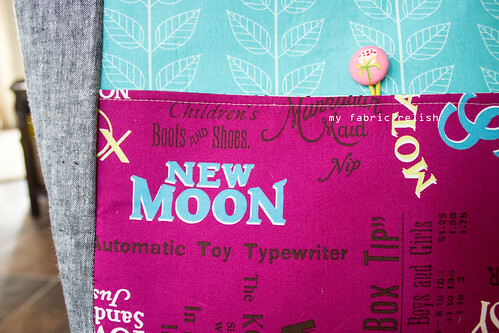 I used two of the FQs from my bundle, then some Simply Color (teal leaf) and linen (forgot the color but it's the black-ish one). 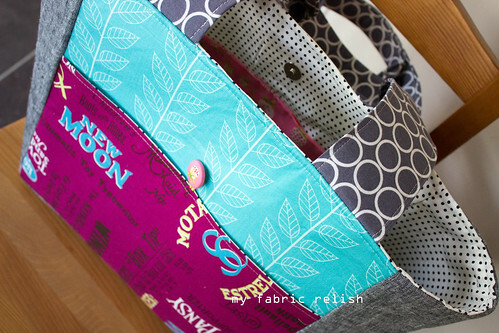 The handles are from my "Stash of the Month" stash through Pink Castle Fabrics (can't remember the name but check out my button on the right) and the inside is a black polka-dot print that I bought several yards from Hobby Lobby. It just about goes with everything and there is no guilt using it because it's cheap and plentiful. I used Pellon 71F for the shell for shape and then just a lighter fusible interfacing for the pockets. I really don't have any words of advice for this project. To be honest, I didn't read any of the instructions. I just took the measurements and figured it out myself. It's a pretty straight forward tote bag. I left the turn about hole in the lining part. I also added a magnetic snap on the inside to keep it closed a bit. It's very wide open otherwise. 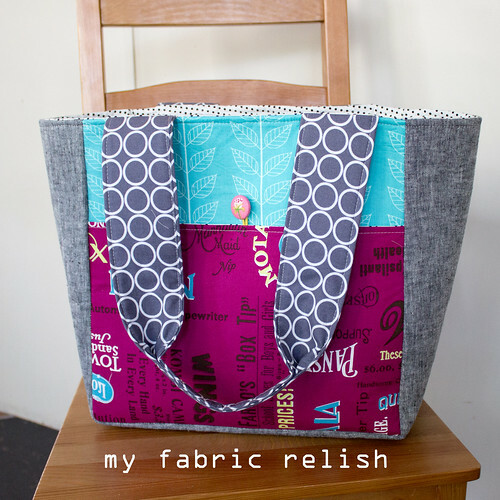 I plan to use this as my sewing on-the-go bag, hence the need for coordination! 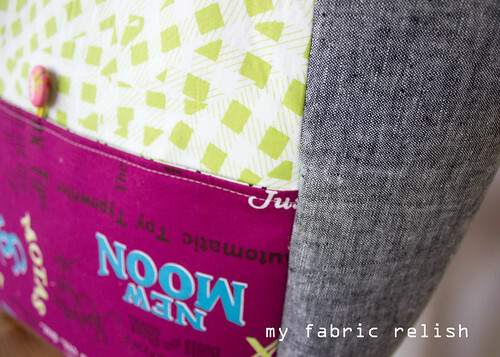 Linking up with all my favs at the right, A Quilter's Table (Zakka 2.0 check-in) and Crazy Mom Quilts! That is a great looking bag Melissa! I love the colors of your Japanese fabrics. You do such a great job at mixing fabrics and colors! Thanks so much, Debbie! I am so happy with the way it turned out! Thanks for visiting me, as always! This is so cute. I love all those Japanese fabrics. I'm on a fabric diet, but I want! Oh no, cant you cheat a little? What's a FQ or two? Haha! I really should take a diet too, but it's so hard! Thanks for stopping by and leaving such a sweet comment! Yes! I have all 4 of the strawberry prints in FQs and plan to incorporate it into as much as possible. hehe. All the briar rose prints are so sweet. Thanks for your thoughtful comment and visiting! some seriously fun colors & a great bag! how fun to have matching accessories, too, from the scraps. Thank you and I totally agree! Purple and green are my favorite colors. I'm excited to get started on the accessories....after I finish some quilting on my two QALs. Thanks for leaving a sweet comment, too! What a great bag! All those fabric work so well together! I'm still googling over these fabrics. Love them! Thanks for visiting and leaving me such a sweet comment! Thanks for stopping by and leaving such a sweet comment. l'm so glad you like the bag! I'm quite in love with it! I think Alyce should sell this bundle all the time. Oh my goodness, LOVE!!!! Thank you for sharing!! Thanks Alyce!! As you can see I'm quite the fan of this bundle. Hehe. Thanks for visiting after I sent you my shameless plug. Ha! That is one cute bag! I'm a little jealous. I have the book, I just don't have the time! Thanks so much, Julie! It's such a fun book...I hope you get some time to make some of the lovelies! Great bag. REally love the fabrics! Thank you, my dear Paula! Sorry I took so long to reply. It was crazy last week! Thanks Kelly! Now if I could get my husband to understand this need! Lol. Thanks for visiting and hosting such a fun linky!! 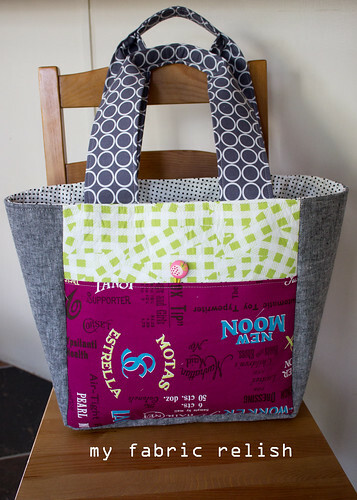 Cute tote! I really like the blue leaf fabric! Thanks for sharing at Submarine Sunday! Thank you!! And thanks for hosting such a fun linky party! I love the leaf fabric too and all of the simply color fabrics for that matter. Thanks for visiting and hope your leg is feeling better! I love your bag! What personality and fun it has! Especially love your strawberry inside pocket... a hidden treasure for you to see when you look inside it! Thank you!! It's fun using those coveted prints in small ways. Thanks for the visit and comment!! Oh.My.Gosh! That is one fabulous bag, and I TOTALLY get why you had to make it first. Wouldn't that be a great book idea? Start with a bundle of fabrics and make the stuff in order, to be left with the scraps for projects at the end of the book! I am so in love with that hot pink print with some turquoise and the way you put the turquoise print behind it. Haha...love that book idea! I'd totally get on board! 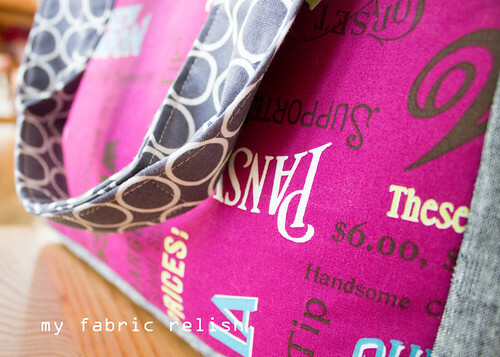 So Glad you like my bag...I'm really enjoying using every last scrap of fabric for these last few projects. Thanks for the visit and delightful comment!!! Darling! 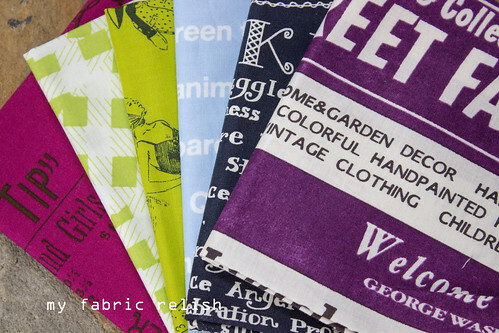 Just love your choice of fabrics! !